Cylinder-Paks are designed to package larger diameter items that require a secure threaded end closure. Varying fixed lengths of tops and bottoms can be mixed & matched to achieve the perfect size, fit and appearance. Durable and re-useable, Cylinder-Paks are the best option for fixed length round tube packaging requirements. Applications include everything from packaging large diameter tools in the cutting tool industry to retail and consumer packaging in the hobby, craft, electrode, office supply, fishing, medical and dental industries. Re-usable Cylinder-Paks are an ideal solution for secure packaging and handling of posters, blueprint drawings, artwork and much more. 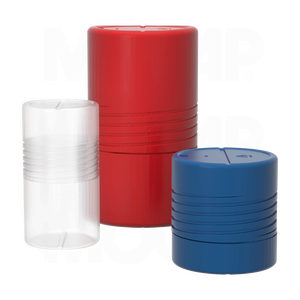 Cylinder-Paks are available in natural High Density Polyethylene (HDPE). Additional colors can be produced in PP and HDPE.